Ralph G. Bross (Jerry), 80, passed away October 13, 2017 in Provo, Utah. He was born November 9, 1936 in Logan, Utah to Ralph A. Bross and Florence (Sonne) Bross. When he was eight years old his parents moved from Logan to a ranch near the Applegate River in Oregon. 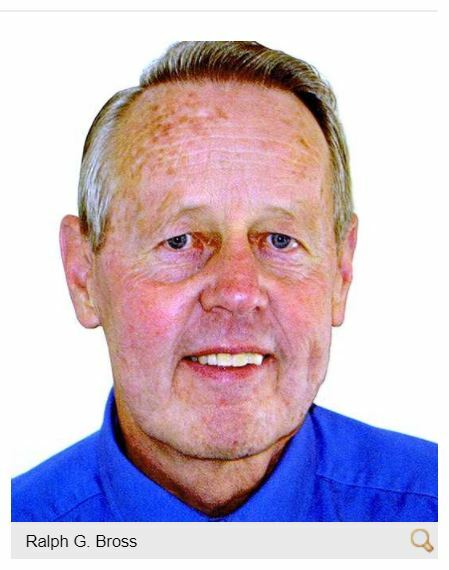 He graduated from Medford High School in 1954 and from Brigham Young University in 1961. He served as a missionary for the LDS Church to the Spanish American Mission. He was married to, but later divorced from Sharee (Skipworth) Bross of Salt Lake City. He taught agriculture and forestry at Molalla High School in Molalla, Oregon, having retired in 1993. In 1997 he moved from Oregon to Springville, Utah to be nearer to his two sons and five grandsons. He is survived by his two sons, Steven R. (Linda) Bross and Mark G. Bross, both of Salt Lake City and his five grandsons, also of Salt Lake City, Christopher S. (Marie) Bross, Jerami M. Bross, Joshua L. Bross, Matthew R. Bross, and Michael A. Bross. He is also survived by a brother, Tedd A. Bross of Las Vegas, Nevada and a sister, Sharon D. (Bross) Cady of San Bernardino, California. And his great grandchildren, Tyson, Lynlee and Ethan. He was preceded in death by his parents a brother, Keith W. Bross, also of Riverside, California. Funeral services will be held, Friday, October 20 at 1 p.m. at the Wheeler Mortuary Chapel, 211 E. 200 S., Springville, UT. A viewing will be held one hour prior to the services at the Mortuary. Burial will be in the Historic Springville City Cemetery.